What’s better than spending summer outdoors on a deck? Spending summer outdoors on a brand new, free deck! 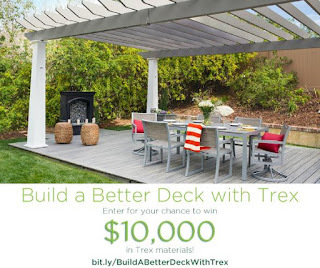 To kick off the first day of spring and get fans and followers excited about the 2017 outdoor living season, Trex recently hosted a Facebook sweepstakes where one lucky winner had the chance to win $10,000 in Trex materials to help them build the deck of their dreams. For this promotion, we enlisted the help of the “Trexperts” – better known as HGTV home improvement personalities Paul Lafrance and Kate Campbell – and asked them to each design a deck that could be built with $10,000-worth of Trex materials. Entrants were asked to vote daily for their favorite deck design for the chance to win the $10,000 prize. Entrants also had the opportunity to share the sweepstakes with their Facebook friends to earn bonus entries. The combination of a high-value prize and the added reach from the Trexperts’ social audiences attracted 96,000 total entries and more than 38,000 new fans, while heightening awareness of Trex products during the critical spring buying season. For those looking for ways to update their own outdoor living space this season, we encourage you to stay tuned to the Trex Facebook page over the next few weeks for another exciting opportunity to win a great prize!